In the end, there was never a doubt. 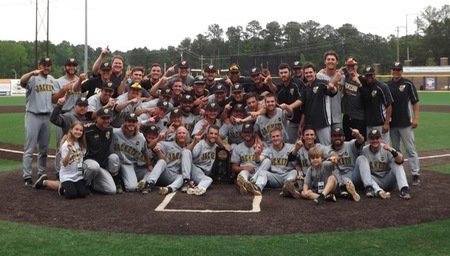 Randolph-Macon swept every game, every opponent, claiming the 2018 NCAA Division III South Regional Championship Sunday afternoon in Holly Springs, North Carolina with an 11-2 romp over Christopher Newport, the same team the Yellow Jackets defeated 4-3 the night before to claim a berth in the final round, clinching the team's first-ever trip to the Division III College World Series. The Yellow Jackets scored six first inning runs and never looked back, moving to 35-7-1 on the season, winning all four regional games, and defeated the Captains for the third time this month and fourth time this season. Randolph-Macon's 35 victories ties the single-season program record for wins set two years ago. For more coverage of the championship game, CLICK HERE. For the postgame press conferences, CLICK HERE.